Spread 1 side of each bread slice with butter. Spread 1 tablespoon pesto on unbuttered side of 4 bread slices; place buttered sides down in 12-inch skillet or grill pan. Top with beef, cheese and remaining bread slices, buttered sides up. Cook over medium heat 4 to 5 minutes, turning once, until bread is crisp and cheese is melted. Serve with pasta sauce. 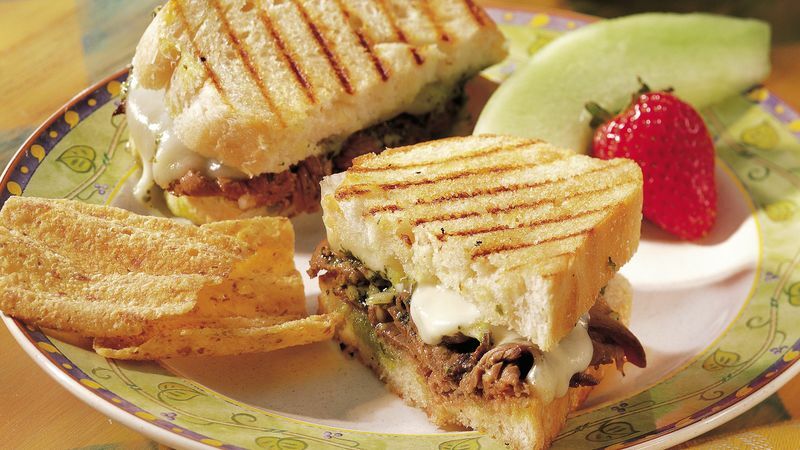 Panini, which means “small breads” in Italian, are all kinds of hearty sandwiches cooked like the American favorite, a grilled cheese sandwich. So although they sound cosmopolitan, they are remarkably quick to make. Grill marks from a ridged grill pan lend authenticity to this sandwich. Some people even use their grills to heat these sandwiches. Like chicken better than beef? Thinly sliced cooked deli chicken changes the flavor without changing the appeal of this sandwich.